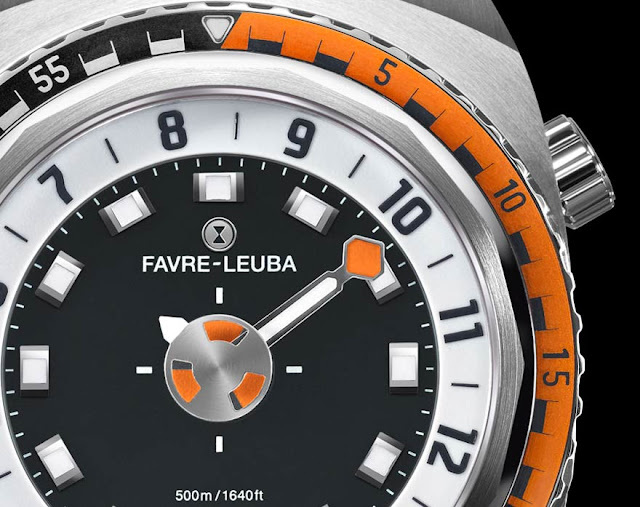 Founded in the 18th century by Abraham Favre (1702-1790), Favre-Leuba played an important role in the watchmaking industry contributing with several innovations and experiencing great success, especially with its diving watches. The company was based in Le Locle until 2010, when it stopped operations. 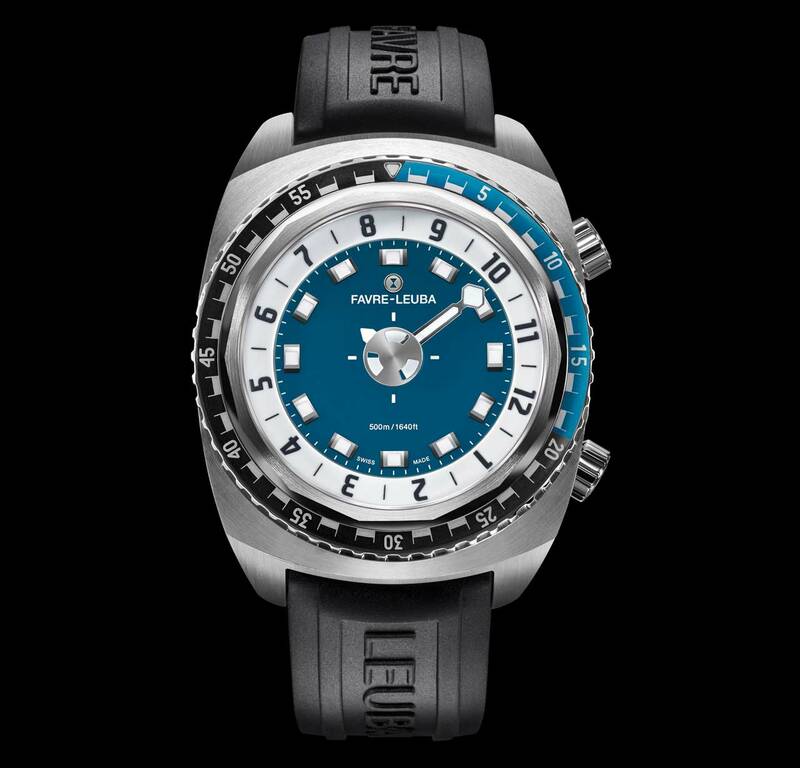 In 2011 the Favre-Leuba brand was acquired by Titan Company Limited, the watch manufacturing company of the Tata group, and relocated to the small town of Zug. 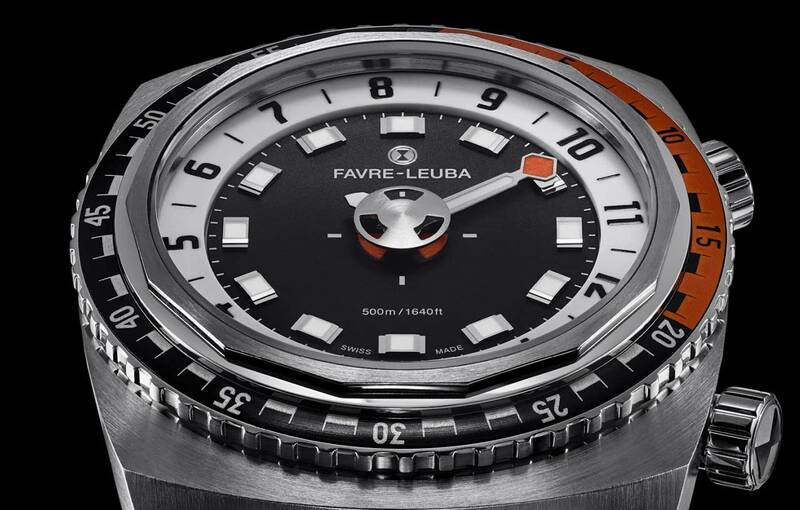 After extensive research into the history of Favre-Leuba, the new team developed a brand new collection of functional watches based on the DNA of the brand but updated with proprietary technologies and a strong, contemporary design. The new Raider Harpoon is a diving watch which focuses on the essentials and introduces a new way of displaying time. 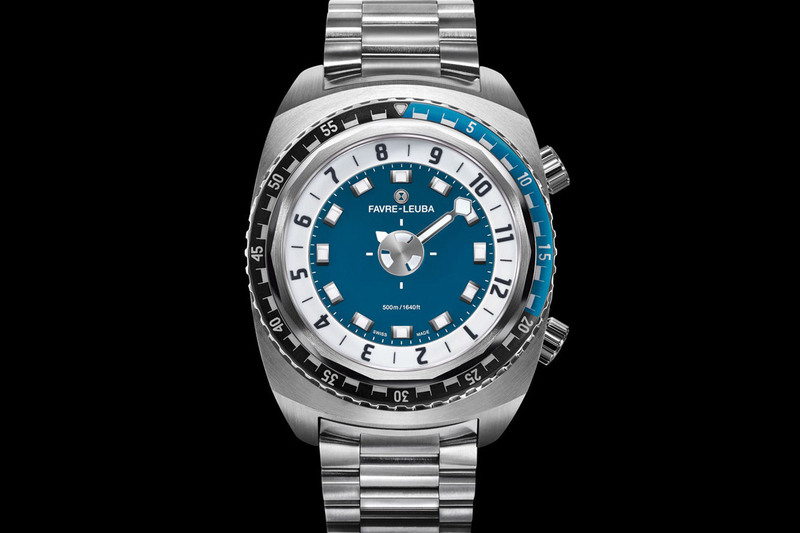 With just one hand for minutes, it ensures that the diver does not mistaken the passing minute by reading the hour hand instead. The diver can also rely on the unidirectional bezel and its 20-minute scale to check the remaining dive time. To make the reading of the time easy even in deep dark depths, the large minute hand and the applied index markers are all generously treated with Super-LumiNova producing blue light emission. The small central disc carries the seconds indicator tip while also showcasing a luminous base through its recesses, a way to control that the watch is actually functioning. Of course, the Raider Harpoon also indicates the hour. This is performed through a patented rotating hour indicator bearing large Arabic numerals. Its rotational speed is adjusted so that the numbers return to their starting point after exactly twelve hours. This way, the minute hand also points to the current hour on the ring making it easy to read the time once you get used to this original display. To better understand how to read the time on the Raider Harpoon, check out the video at the end of the article. The 46 mm x 16.5 mm case is water resistant to 500 metres / 1650 feet and is available in stainless steel or stainless steel with gunmetal PVD coating. The unidirectional bezel is made of anodized aluminium. The screwed-in crown at 4 o’clock is used for winding and time setting while the helium valve at 2 o’clock makes it possible to release the helium atoms that can penetrate the watch after intense use so maintaining the necessary pressure balance. 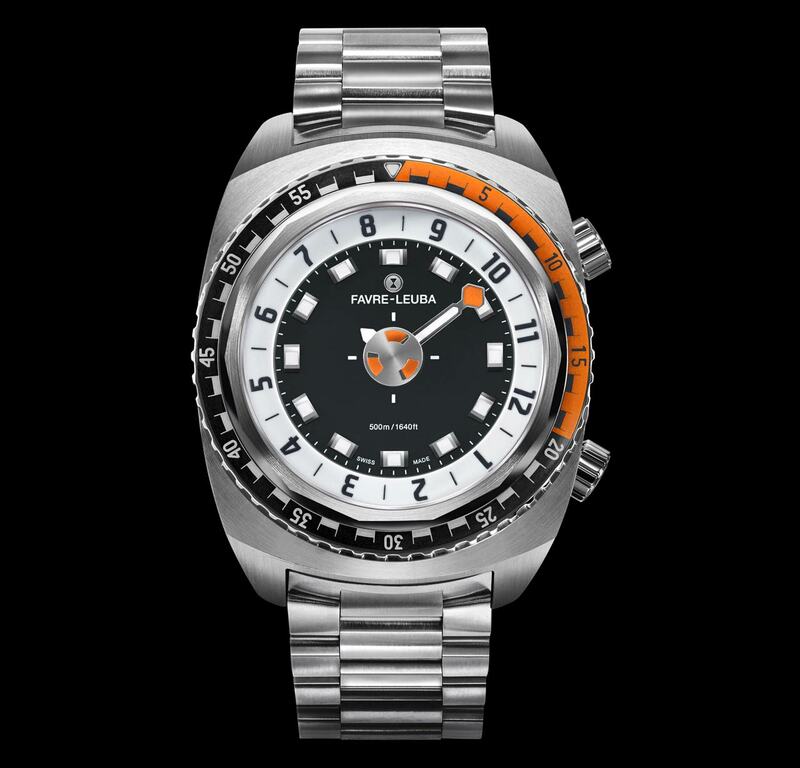 Protected by a sapphire crystal with anti-reflective coating, the dial can be blue or black with orange accents. Interesting! Maybe a bit large but at the end it is a professional diver watch. It will be important to know what price they have in mind. Favre-Leuba Raider Harpoon. Founded in the 18th century by Abraham Favre (1702-1790), Favre-Leuba played an important role in the watchmaking industry. In 2011 the Favre-Leuba brand was acquired by Titan Company Limited, the watch manufacturing company of the Tata group, and relocated to the small town of Zug. The new Raider Harpoon is a diving watch which focuses on the essentials. 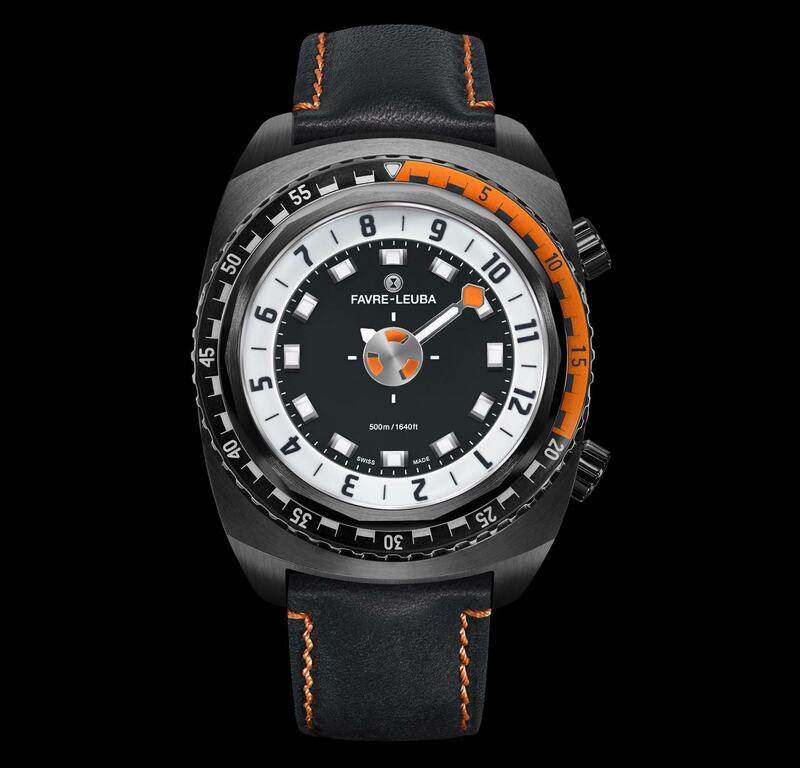 Powered by an automatic movement, the Favre-Leuba Raider Harpoon can be matched to a stainless steel bracelet, a leather strap or a sporty rubber one. Full details and pricing will be officially announced at Baselworld 2017.